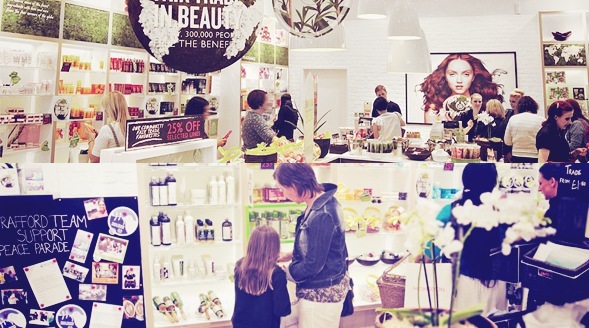 It’s been a long time in the making, but the first wave of new look The Body Shop stores have begun to be rolled out. One of the latest was The Trafford Centre store which reopened last Thursday after 3 weeks of remodelling, banging, ripping out and fitting in. All I can say is that the 3 week wait was definitely worth it. The new stores are cleaner, brighter and more modern and really have propelled the company into the second decade of the millennium. The central feature of the store is the long table that runs from pretty much the back, right the way to the front, filled with things to look at, feel and play with as well as consulting areas for body, skin and makeup. Along the sides are new bays and everything looks de-cluttered and sleek. There’s a real emphasis on the companies core values of community fair trade, animal protection and human welfare. Each product range has a sign or pointer highlighting where the feature ingredient comes from and what’s happening with the community they’re working with; these are so fun to read and as Mary Portas talked about on her latest programme, really promoting the value of the product, having more to it than just a great price. Now I can’t talk about the brand launch without mentioning Lilly. The fabulously stunning model that is Lilly Cole is now the companies brand advocate, the public face of the brand if you please. She’s got her own range of makeup launching in store soon and she’s already been travelling to community projects around the globe, highlighting their work. In brand videos and interviews, she comes across as such a warm and educated individual, perfectly in-tune with The Body Shop. Finally, the packaging is getting a well needed facelift, starting with the famous Body Butters. I wrote an article on them a while back as they had just been announced, but seeing them in store was so wonderful. As well as the picture, the plastic has changed to a more matte effect, which sounds like something not worth mentioning, but when you’ve got moisturiser all over your hands, it makes them so much easier to open. Overall, it really shows what an influential and heritage rich brand it really is and the stores are so much more inspiring and welcoming. You really need to get yourself down to one of the new stores to see it. This article first appeared on MANFACE written by Thom Watson. It was published on Tuesday 15th May 2012 and was last updated on Monday 3rd April 2017 at 4:21pm. It's categorised under The Body Shop, Travel where you'll find more related content.